Some American families still purchase cars solely for transportation or bragging rights. We, however, are a car family, firm in the belief that our cars are both a source of enjoyment and a concrete reminder of our past. One of our vehicles, a 1971 Land Rover Series III, has been in the family since 1973. Unfortunately though, it was not stored in a proper, climate-controlled environment throughout its long life, so this once proud classic has deteriorated into an inoperable, rust-covered ghost of its former self. 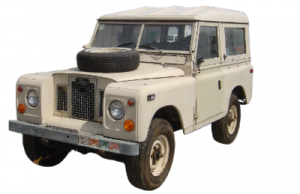 While the Land Rover was in constant use during summers spent at Cape Cod and Nantucket throughout the ’70s and 80s, it was stored in a less than ideal warehouse during the rest of the year. Although used far less during the 90s, the truck was still warehoused in a non-climate controlled building in East Providence, RI, until 2005, when it was moved outdoors and where it sits to this day. After decades of well-meant, but benign neglect, the Land Rover needs a complete chassis replacement, structural and cosmetic body work and a complete engine overhaul to get it back on the road. New England is notorious for its winters, especially along the coast, but the most damaging months for non-climate controlled indoor stored vehicles are July and August, when humidity levels are at their height. When exposed to both weather extremes through outdoor parking, no vehicle stands a chance of survival. At first, casual glance, or even in a photo, the gravity of exterior damage to the Land Rover from inadequate storage is barely noticeable, but further inspection reveals every flaw. Area below the mesh grille is one of several rusted body sections. Serious sun damage and mold growth is obvious in throughout the interior. The sun damage, caused by being stored in an unshaded outside area, includes faded and cracked upholstery and moldings and faded, dry-rotted floor coverings. The mold growth occurred during periods of high humidity in an uncontrolled indoor environment. 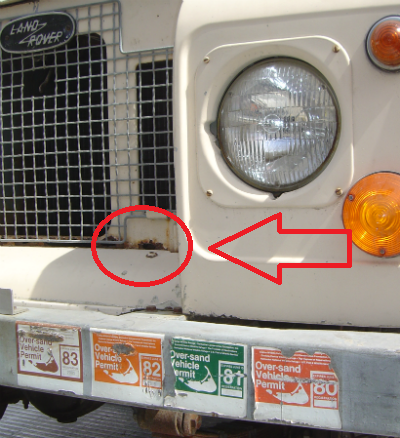 Excessive rust has developed on the chassis and suspension components, the result of a combination of salt water exposure without being periodically rinsed in fresh water and the high humidity periods during New England summers. Large areas of the chassis are so badly affected by the rust that they cannot be repaired. Rodent damage is also a problem with poor indoor or outdoor storage conditions. Mice, in particular, will not only nest inside exhaust systems, carburetors and under seats, they will make their homes in any small, snug space they can find anywhere in the vehicle. To build their nests, small rodents will shred seat padding, carpet or any trash or clothing left in the vehicle. Droppings also damage and stain carpeting and seat upholstery. Evidence of rodent damage can be found in the carpet and seat upholstery of the Land Rover. Because the body is primarily constructed of aluminum the major body panels remain intact, but small metal areas, including the mesh grille in the photo (above right) succumbed to rust and need replacing. With so many moving parts, most of which need constant lubrication to function at peak performance, the Land Rover’s motor is a primary concern. The sun’s heat, summer humidity and frigid winters can cause serious engine damage, whether stored indoors or outside. Corrosion and rust eat away the headers, the intake manifold, carburetor, transmission and spark plugs … pretty much any moving part that’s easily affected by high humidity and heat or exposure to prolonged snowfall and spring thaws. Wires crack, hoses disintegrate from dry rot and connectors and fuses corrode, short out and become useless. If water is present in the oil, the engine is likely seized and extensive rust damage is present inside the cylinders and on the crankshaft. After years of exposure to extremes in weather, the cost to restore the truck would be prohibitive. Added to the time and effort expended in researching for a qualified restoration shop and chasing down hard-to-find parts, restoration costs run from $65 to $100 and hour. Chassis replacement alone can cost from $3,500 to $10,000 and up depending on the type of chassis that’s needed and the actual condition of the vehicle. In addition to the obvious and expensive problems with the Land Rover, the biggest concern in this case is that the family can no longer use the car. It’s emotionally stressful to see a vehicle that has been in the family for 35 years in shambles. Many fond memories are attached to this Land Rover and it’s heart breaking to see something once brought joy in such disrepair. The Land Rover has lost the majority of its intrinsic value thanks to not taking the care to store it properly. Even if it’s restored, the vehicle will no longer wear its original coat of paint, its upholstery or its mechanical parts. It will never again be the same one enjoyed so much so many years ago. This well-used truck has become a hassle instead of the pleasure it once was. The value declines with its condition while the holding costs are rising. Every time this vehicle has to be moved, it costs money. If your family has a vehicle or a classic that is more than just a car for transportation and you want to avoid these problems, get it into a professional storage facility before it’s too late. There is nothing worse than letting a machine sit unused. Use the vehicle occasionally, or have the storage facility maintain and drive it for you while it’s in storage. Many storage facilities provide long-term storage preparation services which will further protect your vehicle. Seekonk Car Storage provides climate-controlled, humidity monitored storage for vehicles throughout the New England region, including Boston, Cape Cod, Nantucket and Providence. Created for the purpose of preserving our own vehicles, we offer more than 25 years of experience in professionally handling vintage un-restored vehicles. The Land Rover is one of the main reasons why we decided to create a dedicated car storage facility. Our facility is overseen by an automotive forensic consultant with more than 25 years of experience in specializing in mechanical failure analysis and automotive forensics. We know what causes a car to fail and we know how to prevent such failures and preserve your vehicle. © 2019 All Rights Reserved S.D. Lyons, Inc.